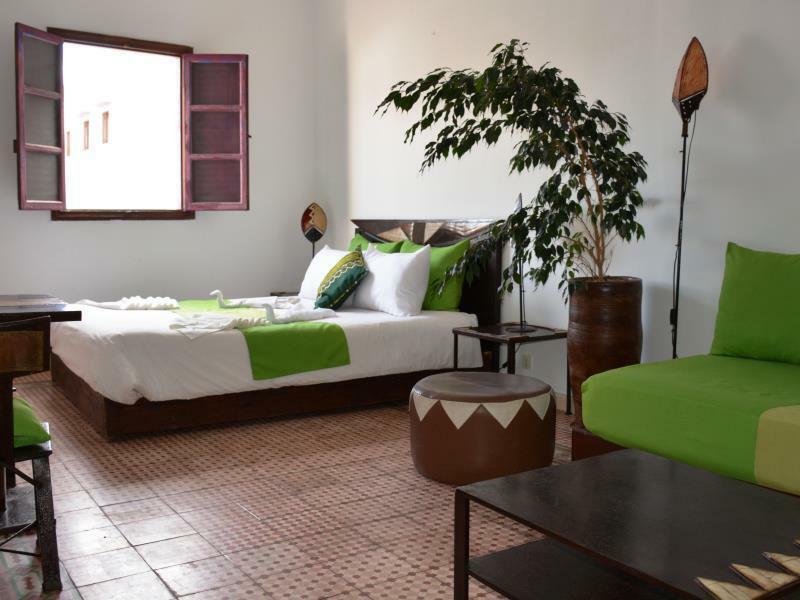 ﻿ Riad Asmitou Essaouira. JIMAT di Agoda.com! Ada soalan mengenai Riad Asmitou? Sesuai untuk berehat dan bersantai, Riad Asmitou terletak di area Pusat Bandar Essaouira di Essaouira. Hotel ini terletak 0.1 Km dari pusat bandar dan menyediakan akses kepada kemudahan bandar yang penting. Tidak kurang hebat adalah akses mudah hotel untuk ke pelbagai daya tarikan dan mercu tanda bandar, seperti Chaim Pinto Synagogue, Le Souk, Fikra Shop in Morocco. Kemudahan dan perkhidmatan yang disediakan oleh Riad Asmitou memastikan penginapan yang menyenangkan bagi para tetamu. Hotel ini menawarkan pelbagai kemudahan di lokasi untuk memuaskan hati tetamu termasuk yang arif. Masuklah ke salah satu dari 9 bilik tetamu kami dan tenangkan hati anda dengan pelbagai kemudahan seperti internet wayarles, internet wayarles (percuma), bilik larangan merokok, penyaman udara, pemanas yang boleh didapati di beberapa bilik terpilih. Kemudahan rekreasi hotel, yang termasuk seperti padang golf (dalam jarak 3 km) , spa, rumah urut, bilik wap direka untuk anda melarikan diri dari masalah dan bersantai. Dengan lokasi yang ideal dan kemudahan sepadan, Riad Asmitou sangat memuaskan hati. The staff here are very nice, friendly and helpful. its in a good location. great breakfast. helpful friendly staff. Enjoyed our stay here very much. Just the right blend of location decor and service. 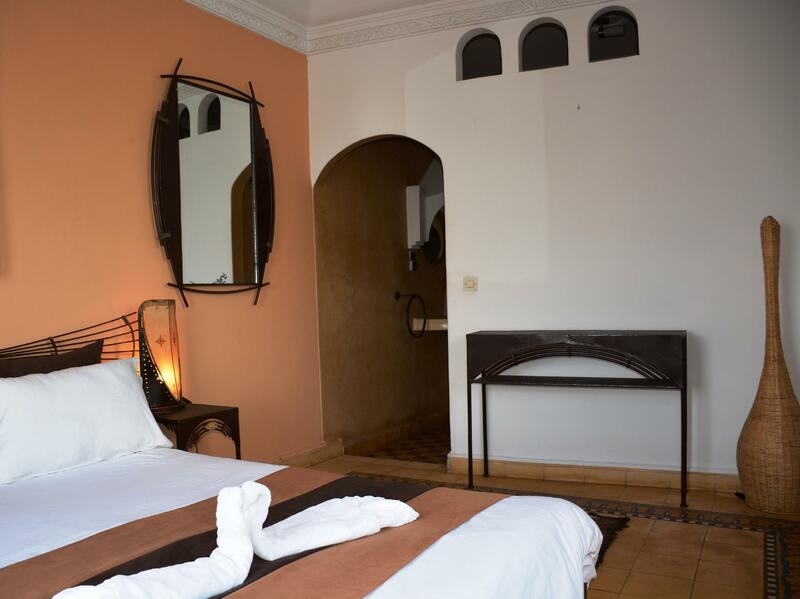 Beautiful riad, very helpful staff, good location. Easy to find right in Essaouira. Friendly service, good breakfast and clean rooms. If you're staying in Essaouira I'd recommend this place. the stay was ok, but not great. the first room was behind the reception. I was fluent in arabic after the first night. The second room was facing the street with a fountain in which the locals were cleaning themselves...nothing against that, but it was very loud, also because of the room being exactly below the breakfast terrace with loud chair movement. The hotel itself and the cleaning staff are very nice. We had one problem with the receptionist. She was trying to scam me left and right. First we booked the hammam, and she assured us it was a nice place. As it turned out, she dropped us off at a public place without any instruction. The lady who was helping us with the hammam spoke no English! Then when we got back, the receptionist again try to charge us extra money for the room! Besides what we already paid thru Agodo. This lady made our experience at this riad a horrible stay. Perhaps we'd been spoilt by our previous riad. 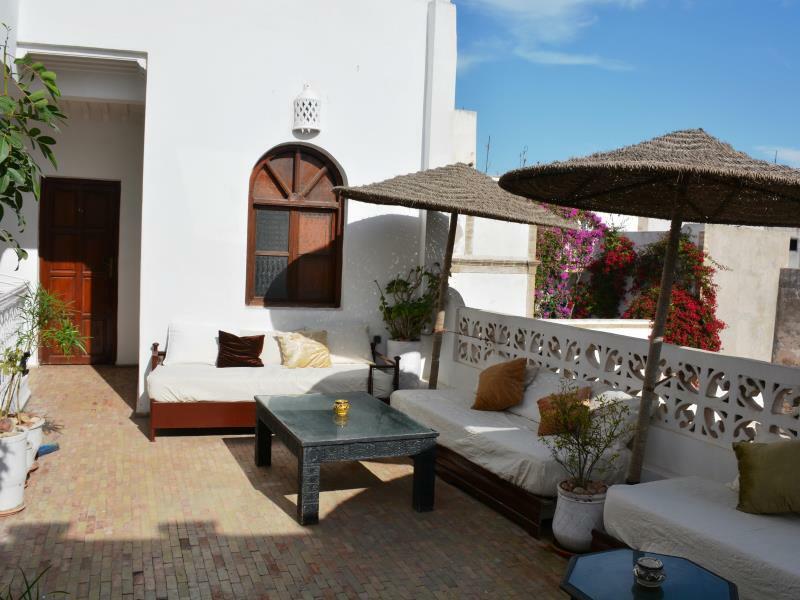 The location is great just a short walk from the main street of the medina. Essaouira itself was terrific. We had two days here and enjoyed every moment of it. The people are nicer and definitely more laid back than in Marrakech. The room was a little smaller than our previous one but clean. However there was not door between the bedroom and the bathroom which also contained the toilet. A little unusual and not something we encountered anywhere else. The bed was ordinary also and not the most comfortable. Our visit was marred by the annoying alarm clock that went off very early both mornings well before any of the guests got up. It went on for a long time before someone finaly turned it off. That and being told on the last morning that we would have to eat breakfast at the reception table (because it appeared a large group were using all the breakfast tables). We asked to eat on the terrace but were told it was not convenient. The staff did arrange a great camel ride for us. Jättefint rum. Trevlig personal. Bra läge. Trivdes jättebra! Häftig inredning och supermysigt rum. Nära till största shoppinggatan, restauranger och sightseeing. Mycket trevlig och hjälpsam personal. God frukost! Sehr nettes Personal, gute Lage. Einziger Wermutstropfen: Tax muss wider den Agoda-Angaben nochmal separat entrichtet werden. Da wir ein außergewöhnliches Sonderangebot hatten, freuen wir uns vor allem darüber, wie günstig der schöne Aufenthalt im Riad Asmitou war. Aber auch zum regulären Tarif ist das Haus eine absolute Empfehlung. Wir hatten ein sehr geräumiges und komfortables Zimmer (bei dem Preis hätten wir eher gedacht, im Vergleich zu den Fotos enttäuscht zu werden) - und wurden noch gefragt, ob uns das denn genüge. Zuvor wurde uns diese Gegend der Medina von Essaouira als Schmuddelecke angekündigt. Blitzsauber ist es dort tatsächlich nicht, dafür ist man fast mittendrin im echten Souk-Leben. Es gibt kaum einen besseren Ort, um Essaouira zu entdecken - und das Riad mit seinen Dachterassen bietet genug Erholungsraum. Difficile da raggiungere per la strada dissestata da lavori in corso. 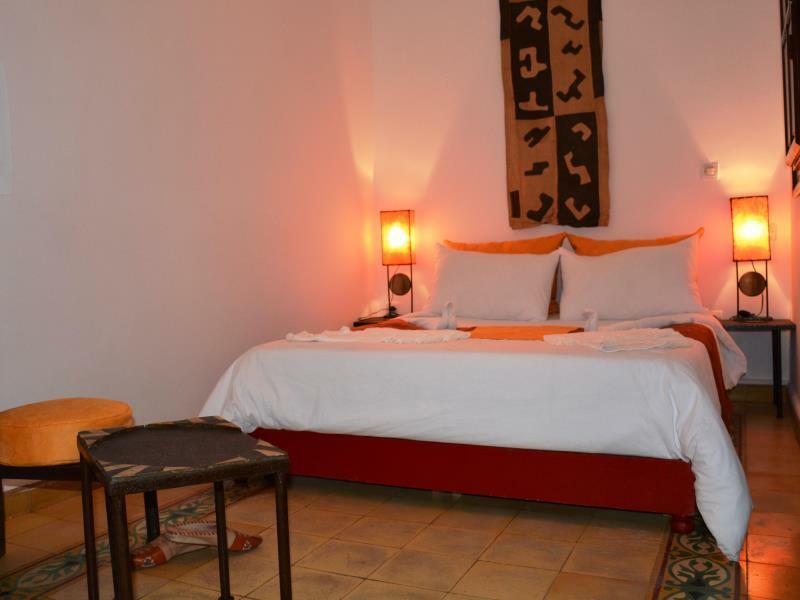 Riad piacevole ma con bagno non confortevole. Rumoroso sia di giorno che di notte. Riad de petite taille, idéalement situé dans la Médina, propre, mignon, personnel au petit soin, petit déjeuner ou apéro sur les différentes terrasses.... juste parfait ! Vous pouvez y aller les yeux fermés.